What is the Client Access portal? 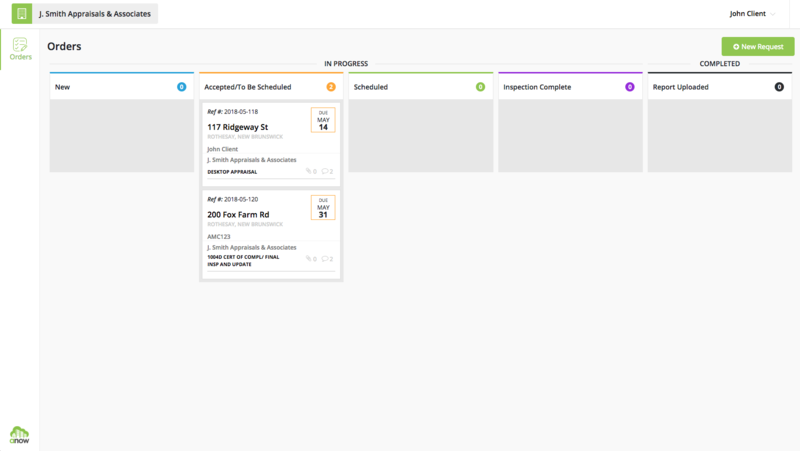 Learn how your clients can use Anow Connect to track and manage the progress of their ordered appraisals! The Client Access portal that's now available through Anow Connect is what gives your clients the freedom to monitor their orders whenever they want. And the best part of all? You don't have to waste any more of your time doing client updates or sending out notification emails; Anow is going to do this work for you! 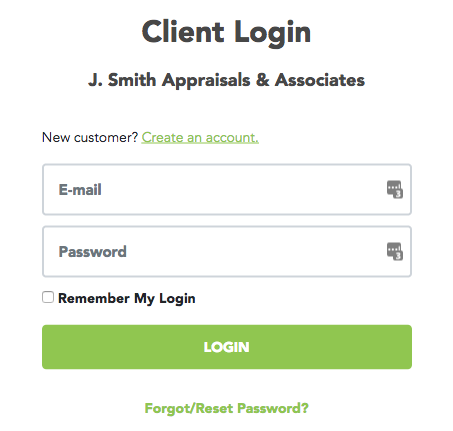 Once your client has signed up for a free account and placed an order using the Order Form, they will want to go to their login page (using the Client Access link found under your Connect Settings). New - The order has been placed by the client, and the company has yet to accept or reject the order. Accepted/To Be Scheduled - The order will move to this column once the order has been accepted by the company from their Anow Order Desk. Scheduled - When the order has been given a scheduled Appointment Date. Inspection Complete - When the Appointment Date set in Anow has passed, the order will move under this header. Report Uploaded - The Final Report has been added into Anow by the company doing the appraisal. 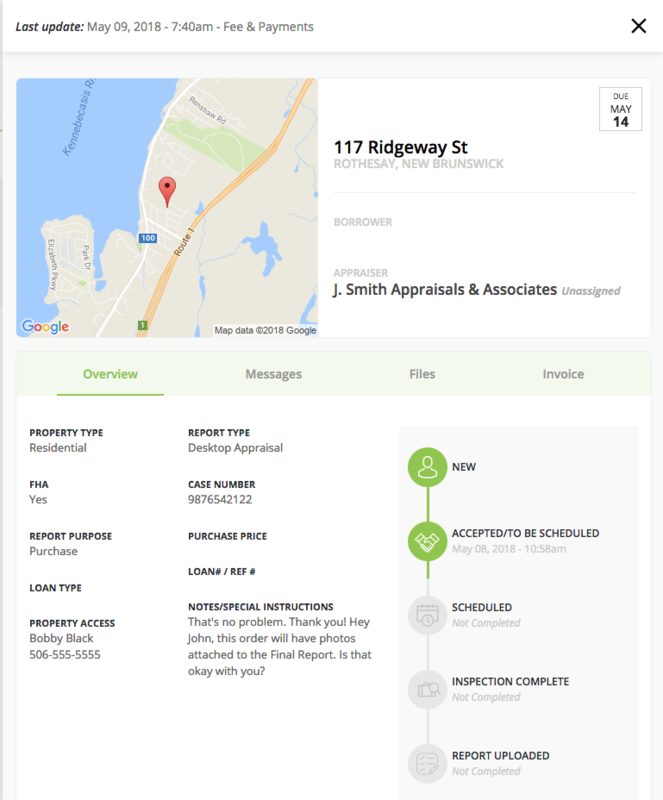 At any time, your clients can click on an appraisal from their main screen to reveal a slide-out with further details on the order they selected. As you can see in the preview below, Report Type, Property Type, FHA Case #, Report Purpose and Loan Type are just a few of the other appraisal fields that are visible on the slide-out. Switching between the Overview, Messages, Files, and Invoices tabs will provide your clients with even more information regarding this appraisal that they have ordered. 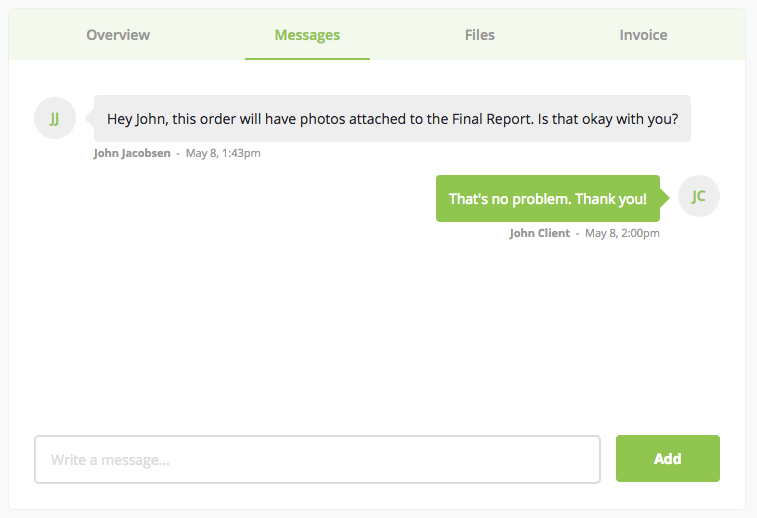 The Messages tab is especially useful, so be sure to check out our support article titled Can I communicate with clients through Anow Connect? for more information.